Before writing a review, I try to reserve judgment until I have eaten at a place at least three times. No need to get too excited if I had just happened to be lucky and come in on a day when the fish had just been delivered, my waiter was in a great mood, and the reservation for the best table in the house had been canceled and given to me instead. 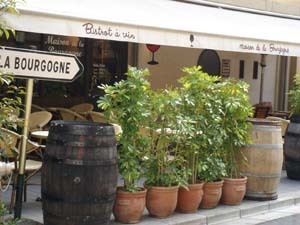 Writing about Maison de la Bourgogne, however, I could not be more sure that the great service and food were consistent: I have eaten here more times than I could count. Located in what is quickly becoming the French-district of Kagurazaka, Maison de la Bourgogne is the quintessential sidewalk café. A wine bistro with an extensive wine selection and simple, authentic French fare, the weekday lunch set is my recommendation. At ¥1500, the set is beyond a bargain. After starting with an amuse of pate on toast, there are five each of different hors devours, mains, and desserts to chose from. Coffee or tea is also included. The hors devours themselves are large in portion, the refreshing country pate and classic quiche dishes both come with an accompanying side salad (My favorite is the soufflé, though it does not). The main dishes also do not disappoint. Offering a changing menu of both meat and fish options, they are always full flavored and hearty. Desserts have included crème brulee, crunchy tarts, and homemade hazelnut ice cream and sorbets. The staff is also incredibly friendly, and I have on more than one occasion been given a complimentary sparkling wine with my meal. Even in the winter, the heat lamps make the patio seating bearable, although the interior is cozy as well. That this bistro is one of many French restaurants in Kagurazaka only highlights how much it’s food and service stands out. 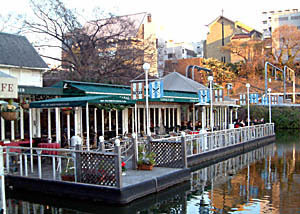 The Canal Café offers two possible dining options: the restaurant side café, which promises pizza and pasta in a traditional restaurant setting, and the deck-side café, which allows you to purchase food cafeteria style and bring your pet to dine by the canal with you. Visiting the deck side is a great idea for hanging out alone or with friends on a warm day. Soaking up the sun while watching children out in rowboats with their fathers is a pleasant backdrop for a long conversation. On a recent winter afternoon, I visited the restaurant side for the first time. Sitting outside by the water, the view and ambience were equally as pleasant as the deck side, however, I wrongly expected the food there to be of a higher caliber than it’s take-out-style counterpart. Settling into a menu featuring a full page of pizza options, I was disappointed to find out that there were no pizzas being served that day. My friend and I ended up ordering a panini set and a curry set, and I ended up being disappointed by both. The Panini was not in fact a grilled Italian sandwich, rather it was a cold sandwich served on toasted French baguette. Not bad, but hardly remarkable. The Thai green curry was mediocre, and I became immediately suspicious that it had come out of one of those instant curry aluminum bags. Once finished with our quickly cooling tea, my friend and I tried to get closer to a heat lamp that may or may not have been on (we couldn’t quite tell). Looking out onto the canal, people had started to rent out boats for the afternoon, and I watched a pig-tailed child lean out over the edge of a rowboat to feed some carp. The sun came out, and I started to think that maybe it isn’t always about the food after all.